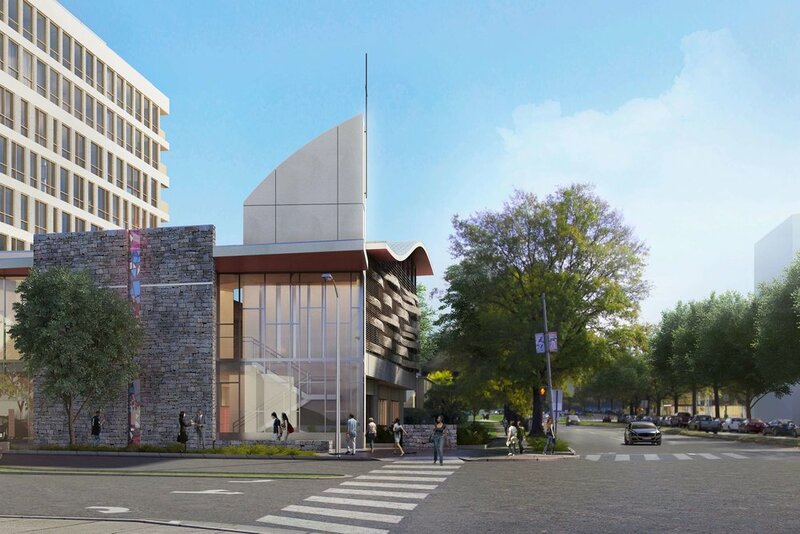 The 680 Street project is a mixed-use development in DC’s southwest waterfront neighborhood that integrates the program of Riverside Baptist Church and The Banks Apartments. This programmatic combination allows the site to maintain its current use as Riverside Baptist Church, which has provided the Southwest DC community with access to important cultural and spiritual resources for over 160 years, while also evolving with a neighborhood in the midst of a significant development boom. The site occupies an entire block at the corner of Maine Avenue and 7th Street SW facing the Wharf’s central 7th Street Park, earning it the nickname ‘Gateway to The Wharf.’ The gateway concept is celebrated with two large-scale water walls that mark the residential building entrance and recall the nearby riverfront. These entrances are connected by a plaza at the main corner that serves as a neighborhood gathering space for residents, church-goers, and community members alike. Additional streetscape, roof terraces, and a ground-level courtyard space contribute both building-specific and neighborhood-wide amenities. The LAB team, in collaboration with the architects, designed the residential amenity areas to accommodate small social gatherings. More private penthouse terraces are accented with seasonal plantings. A tranquil sound-oriented garden is nestled between the two buildings and provides a space for contemplation and reflection adjacent to the pastor’s office. A larger ground-level courtyard is home to a play area intended to support the needs of a neighboring daycare facility. Each space is carefully articulated by lushly-planted bioretention areas that are part of a comprehensive stormwater management system. The bold planting palette creates a sense of lushness throughout the project that, along with the cooling water walls, make a subtle reference to the nearby Washington Channel. LAB aided in achieving PUD approval, LEED Gold Certification, and DC Stormwater Management and Green Area Ratio requirements.